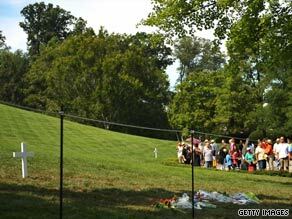 The Arlington National Cemetery gravesite of Sen. Edward M. Kennedy opened to the public at 8 a.m. Sunday, a little less than 12 hours after he was buried. His brothers, President John F. Kennedy and Sen. Robert F. Kennedy, are buried a few hundred feet away in the sprawling cemetery in Virginia. The gravesite is identical to that of his brother Robert. It features a two-and-a-half-foot white cross and a marble marker, which reads “Edward Moore Kennedy 1932-2009.” A temporary ropeline was set up for people to approach the gravesite and pay their respects, but there are plans to build a walkway in the future. Several flowers and cards were left by visitors in the hours following the opening of the site. A cemetery official said the site would be closing Sunday afternoon for an expected visit from Victoria Ann Reggie Kennedy, the senator’s widow.